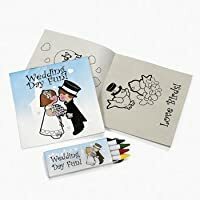 12 Children's Wedding Activity Sets. Each set includes a 5" 20-pg. activity book and a box of 4 assorted non-toxic crayons. Each set is individually packaged and perfect to hand out to your young guests at the reception or rehearsal dinner. Conforms to ASTM D-4236.